Apparently America believes its allies to be wimps and weaklings. 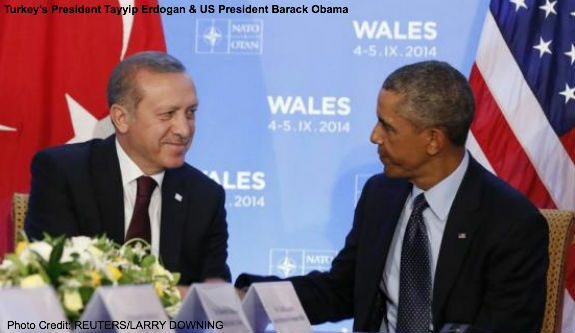 Why else would NATO officials promise to defend Turkey from the Islamic State? Surely this well-armed U.S. ally can hold off a few thousand Islamic irregulars, some of whom Ankara allowed to enter Syria next door. The rise of the Islamic State has led to much nonsense from Washington officials who speak as if the group was capable of conquering America. ISIL is made up of dangerous fanatics, but in the form of the Islamic State they are largely powerless to harm the U.S.
Their conventional capabilities are minimal compared to those of the U.S. Moreover, so long as the Islamists are attempting to conquer territory they cannot afford to launch terrorist attacks on America, which would bring down the full wrath of the U.S. military on the return address they had so thoughtfully provided. However, Ankara is partly to blame for ISIL’s rise. The Erdogan government decided to support the ouster of Syrian President Bashar al-Assad and allowed opposition fighters from all sides, including ISIL, easy access to the battlefield. Reported the Washington Post: “eager to aid any and all enemies of Syrian President Bashar al-Assad, Turkey rolled out the red carpet.” The government simply looked the other way as members of the Islamic State and other Islamist groups traveled to Syria. A politician from Reyhanli, Tamer Apis, complained that the government “welcomed anyone against Assad, and now they are killing, spreading their disease, and we are all paying the price.” While there was a lot of blame to go around, “this is a mess of Turkey’s making,” he added. The Erdogan government since has changed course, confronting insurgents it once welcomed. But passage for people and materiel through the 565-mile border still is available at a price. Turkey is paying the price of its own folly. There’s no reason to share the burden with 27 other NATO members. Especially since Ankara can well handle the fall-out. Turkey can easily defeat anything ISIL throws at the former. Why would NATO have to protect Turkey? Indeed, Ankara should be thinking offense. If the Islamic State consolidates its position, Turkey is likely to be a site for the group’s expanded activities. Last year ISIL troops told a captured Turkish photojournalist that Erdogan and other top officials were “infidels” and claimed that “Turkey is next.” One brigade was made up mostly of Turks. Ankara is part of NATO’s “core coalition” targeting ISIL. Why are U.S. planes and drones striking Islamic radicals operating next door to Turkey when its forces could take the lead? ISIL is evil, but that does not make it a serious military threat against America. The Islamic State is a much more significant threat against Middles Eastern states, such as Turkey. These nations also hold the key to the group’s defeat. They have the interest and capability. As Islamic nations they also have credibility. All that’s lacking is necessity. If Washington or NATO rushes in to relieve them of responsibility, they likely won’t act. For once these nations should be held responsible for their past policies.